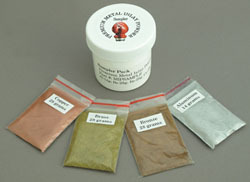 This metal powder is used for inlay as seen in the "Metal Inlay Techniques" DVD by Ted Sokolowski. We offer it in 1.5 oz or 3 oz quantities. The powder is glued into a recess using thin CA glue. The special Pro Tips are perfect for precise placement of glue. A sampler pack is available that includes all four types of metal.